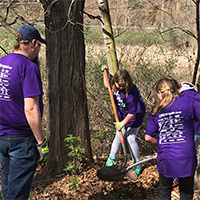 We came together at our local parks for clean-up projects that will keep our local nature havens extraordinary! They were busier than bees and as chattery as a garden full of goldfinches. 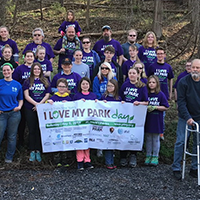 On the first Saturday in May, scores of volunteers flocked to Mark Twain State Park in Horseheads to celebrate spring and participate in the seventh annual I Love My Park Day. 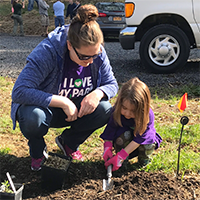 The statewide event is coordinated jointly by Parks & Trails New York and New York State Office of Parks, Recreation and Historic Preservation. 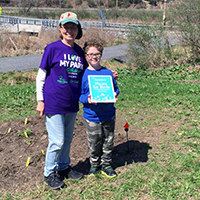 On Saturday, May 5, 2018, Chemung Valley Audubon Society (CVAS) collaborated with Friends of the Catherine Valley Trail (FCVT) to undertake a number of activities on "I Love My Park Day" at the new trailhead parking at the Domes of the Mark Twain State Park. 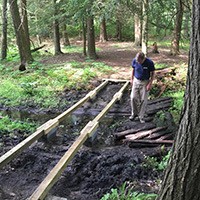 We coordinated our activities with the regional office of the New York State Office of Parks, Recreation and Historic Preservation and with the park manager of Mark Twain State Park. This excellent cooperation and coordination assisted in accomplishing our stated goals. 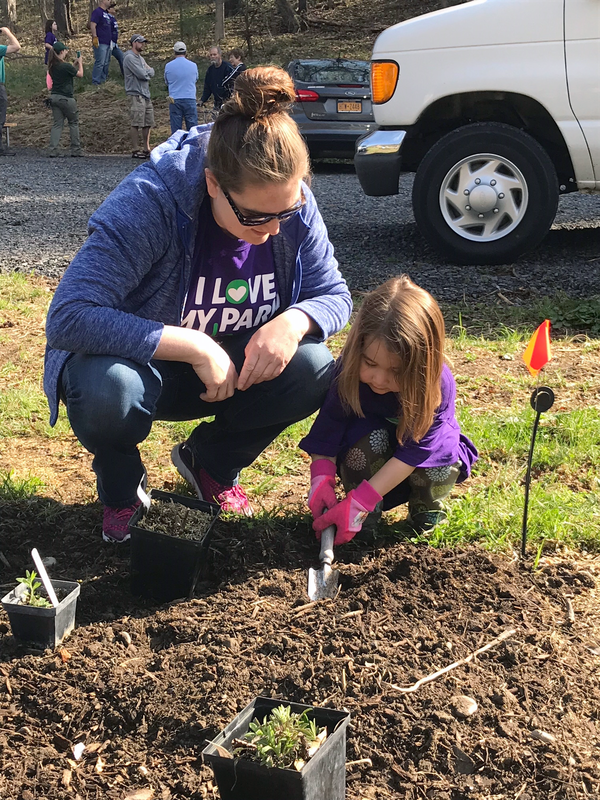 On the morning of "I Love My Park Day," members of CVAS, FCVT, and NYS Parks arrived early with tools and plants. 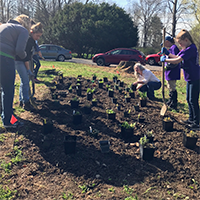 Volunteers registered at 9:00am and received a free T-shirt and an Audubon seed packet promoting plants for pollinators. 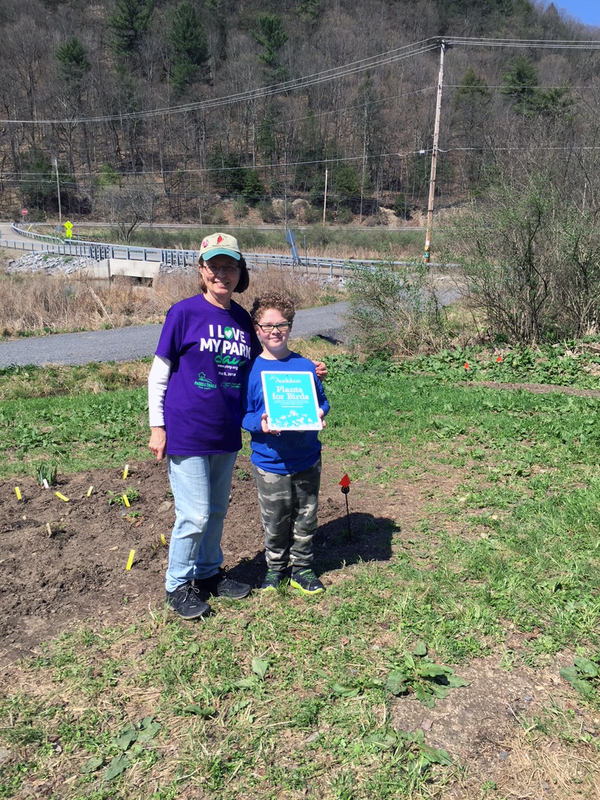 We had 55 volunteers, including students from Horseheads Youth Bureau, members of CVAS and FCVT, and families. Scott Shaw of FCVT welcomed everyone and thanked them for coming out to help with projects to improve their state park. About this time, Rick and Betty Eck stopped in for a visit. 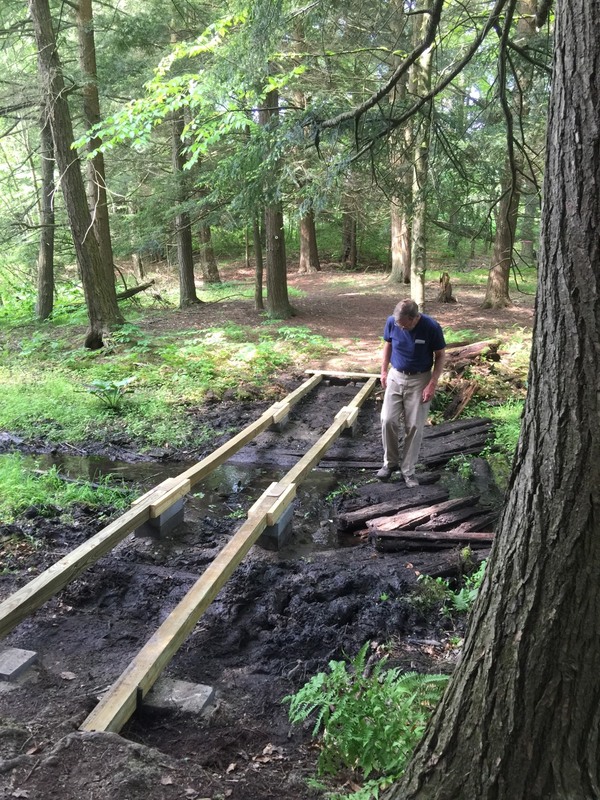 Rick Eck was the initial proponent and leader in developing the hiking trails at the Domes. After describing a list of tasks, we broke out into teams and began working. 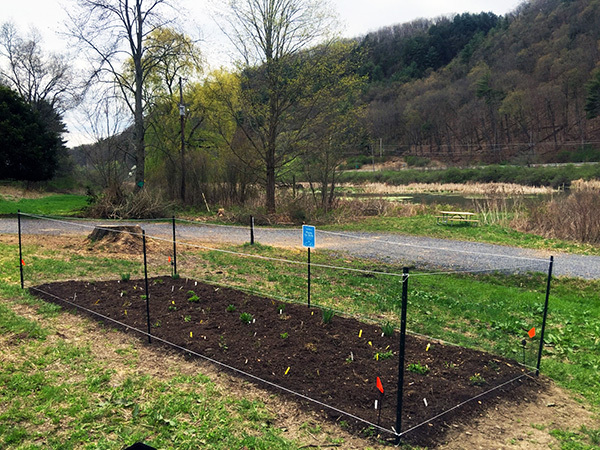 Chemung Valley Audubon Society had already rototilled a 160sqft (8' x 20') area by the parking lot. 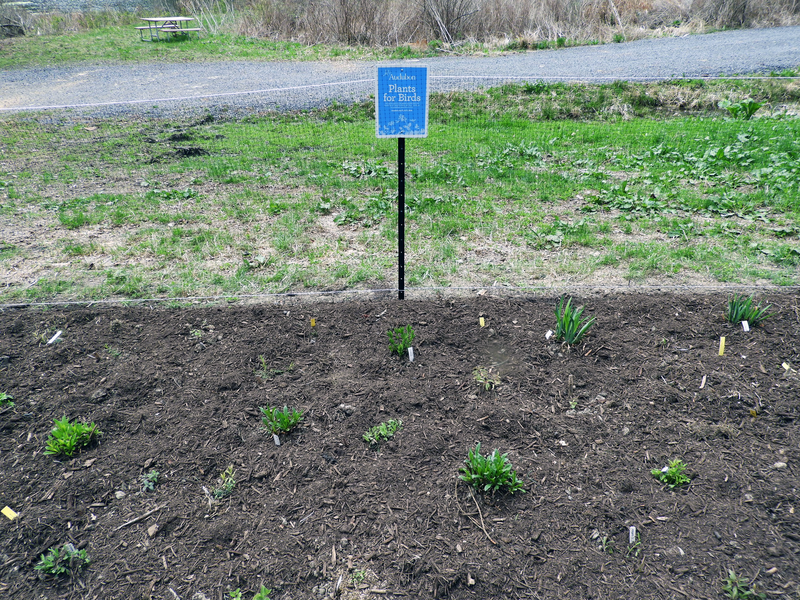 Compost donated by Chemung County Soil and Water Conservation District was spread and rototilled into the planting bed. 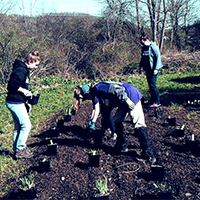 CVAS purchased native wildflowers species approved by NYS Parks at Plantsmen Nursery in Ithaca, NY. 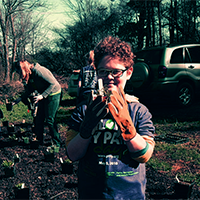 Volunteers randomly placed and planted approximately 50 potted plants of nearly 15 native wildflower species including wild bergamot, swamp milkweed, golden Alexander, mountain mint, blue vervain, cardinal flower, gray goldenrod, tall white beardtongue, wild blue indigo, boneset, Joe-pye weed, blue flag iris, and New England aster. 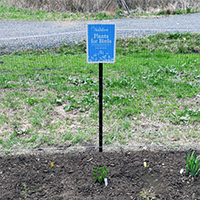 We installed deer fencing around the garden to shelter the plants from deer and geese. 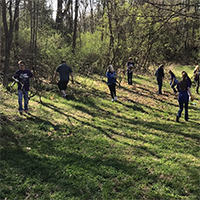 On the parking lot's east slope, volunteers removed invasive species, vines, and dead branches, then raked the entire slope along the parking lot edge. 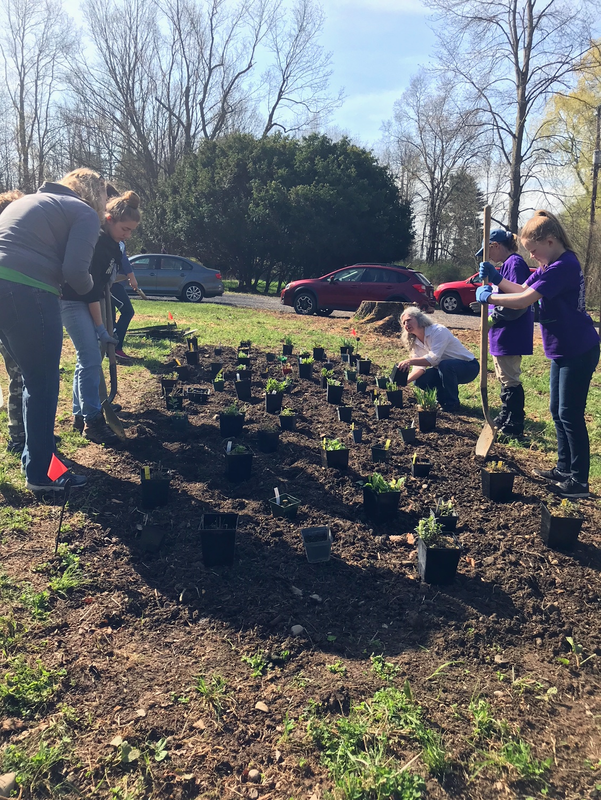 CVAS purchased five potted native shrubs at Plantsmen Nursery including chokecherry, northern bayberry, witch-hazel, and serviceberry. 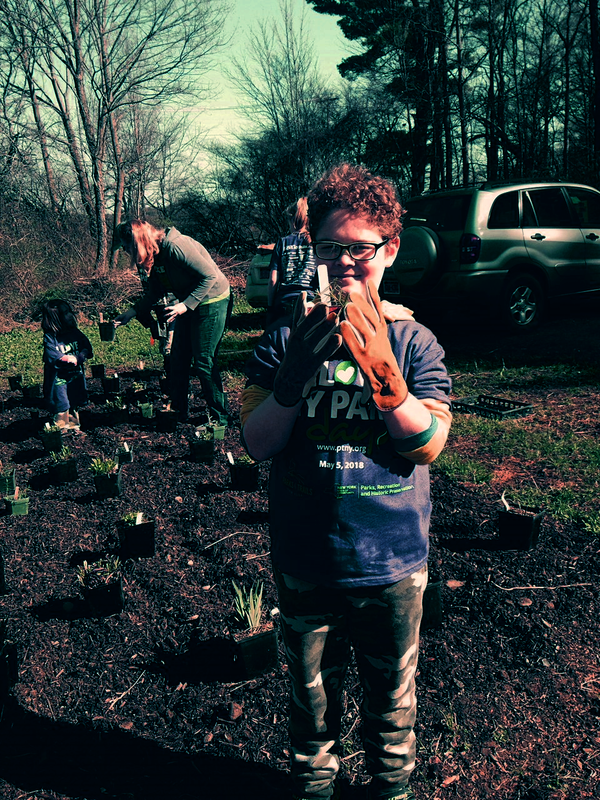 The volunteers planted the shrubs and 25 seedlings of native trees including black cherry, red maple, and red oak. 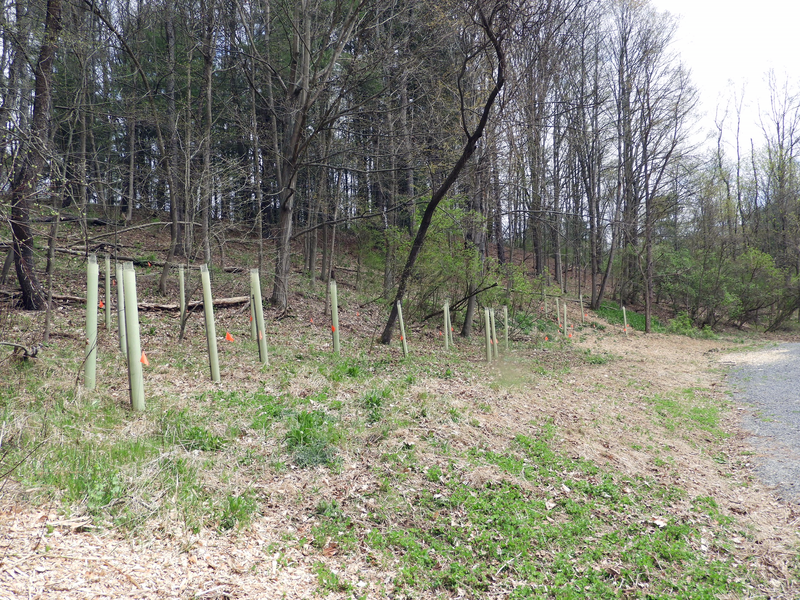 Later, we installed tree shelters to protect the seedlings from deer. Just south of the parking lot along the edge of the marsh, there were invasive species of honeysuckle growing with some native dogwood. 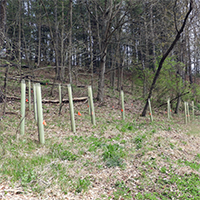 The volunteers cut and removed over 20 large clumps of honeysuckle and then proceeded to remove the stumps. 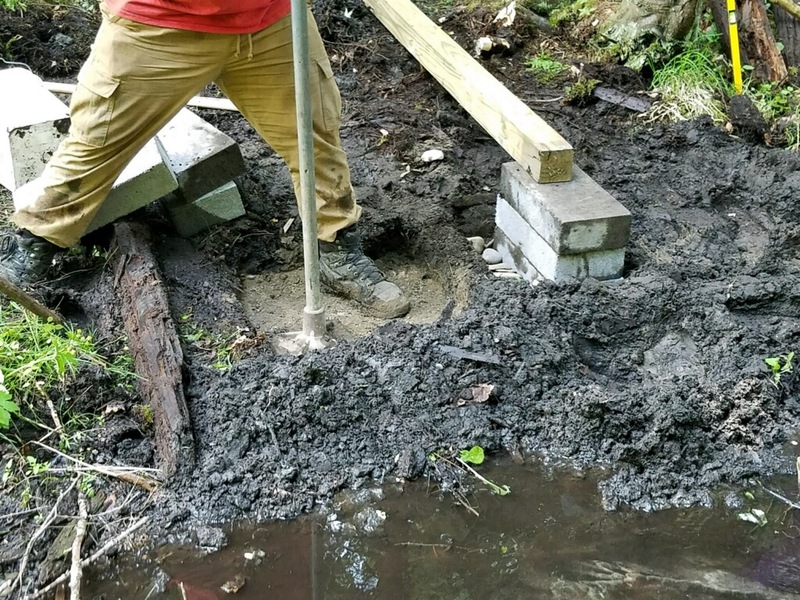 Some stumps were too large to remove. The volunteers piled all the stumps and branches so they could be easily removed by NYS Parks. The Chemung Valley Audubon purchased 5 potted native shrubs at Plantsmen Nursery: one buttonbush, three winterberry, and one elderberry. 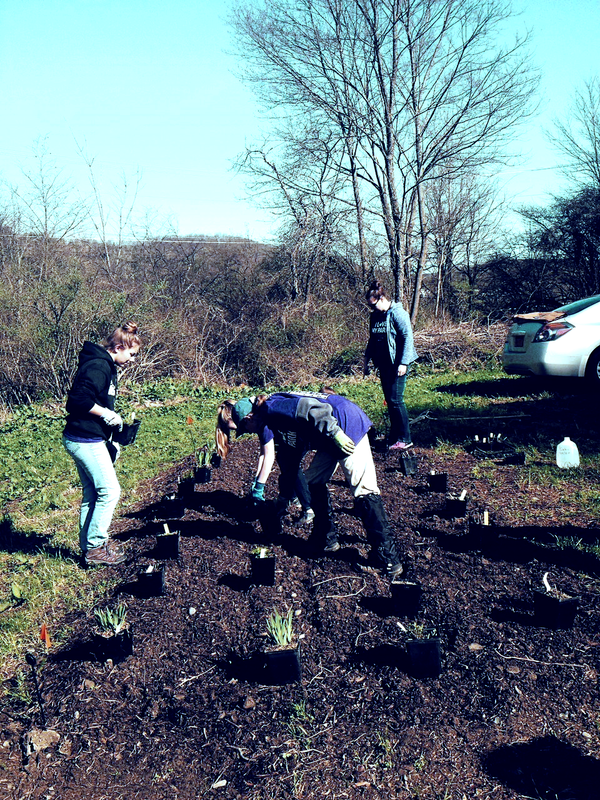 The volunteers planted these shrubs along the edge of the marsh. The hiking trail starts at the south edge of the parking lot, goes up the grade, then turns, heading toward the Domes. 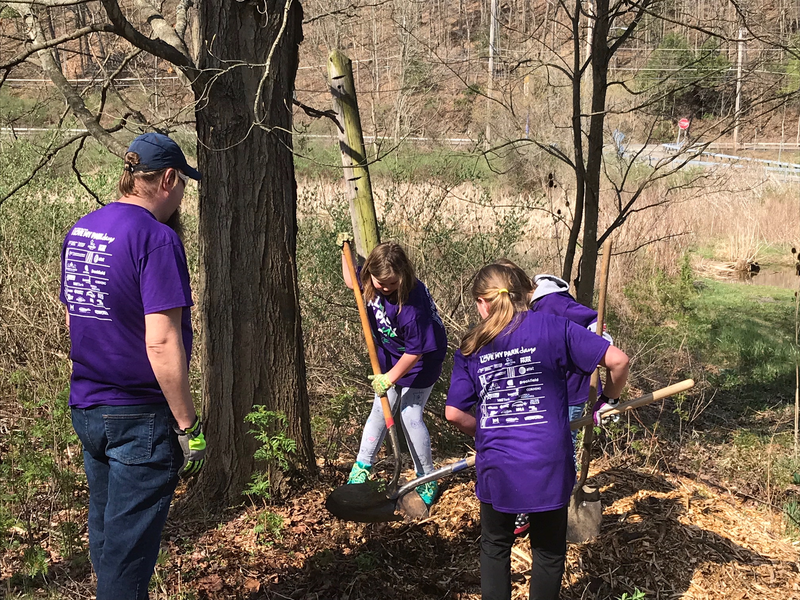 There were broken limbs, invasive species, and brush encroaching on the trail. 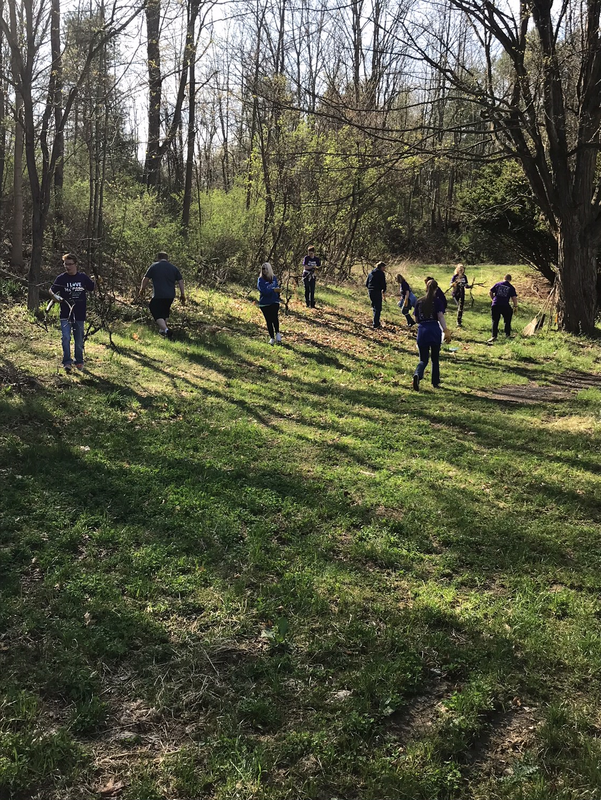 The volunteers cut back the brush, removed invasive plants, and picked up limbs. 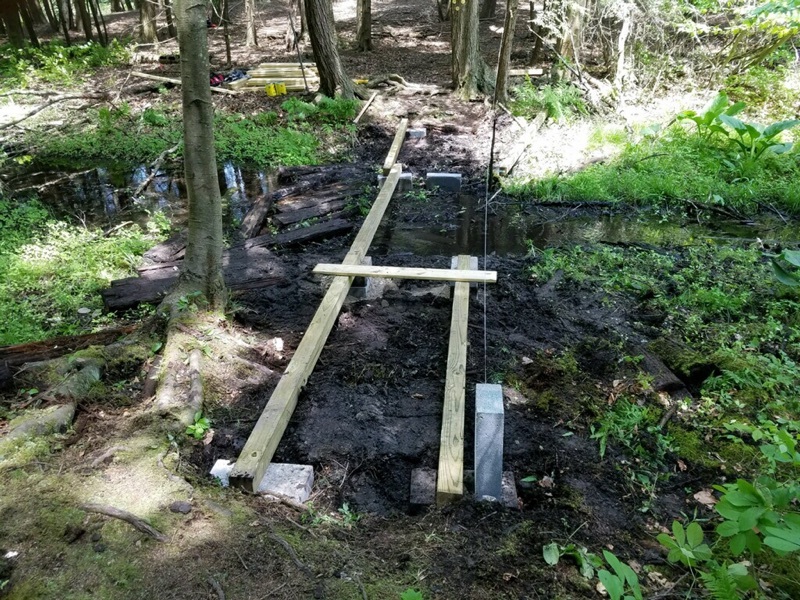 NYS Parks removed the brush piles from the site. 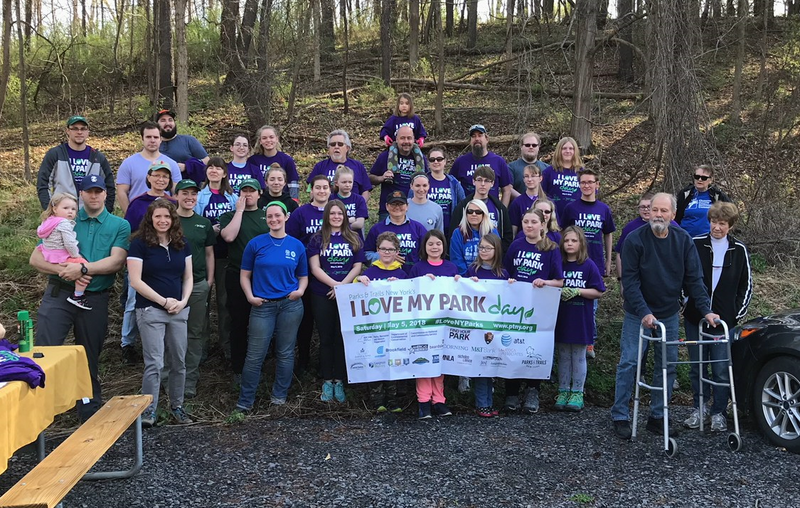 The birding-hiking trail going from behind the Domes to the outer loop was installed a number of years ago on another "I Love My Park Day." With the high winds this winter, some trees and branches fell over the path. 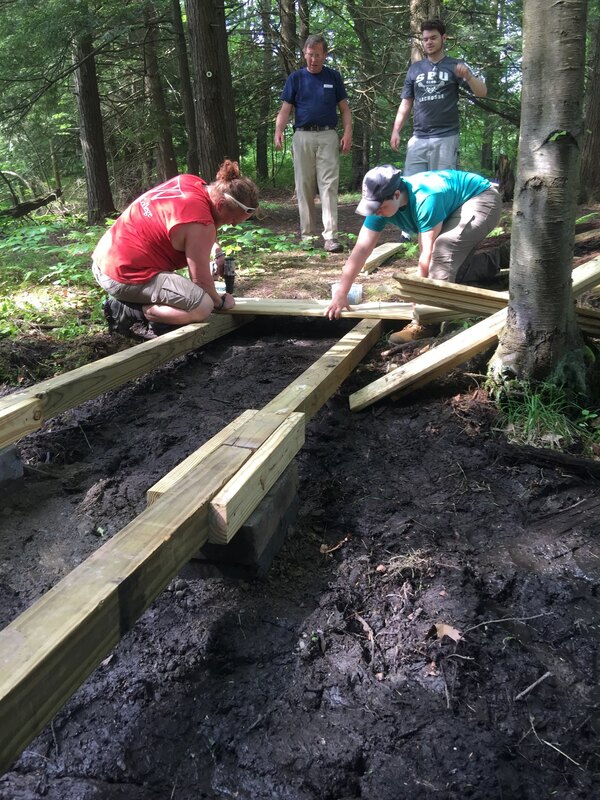 Ten volunteers from the Horseheads Youth Bureau spent the morning cleaning and raking the trail, making it safe for hikers. 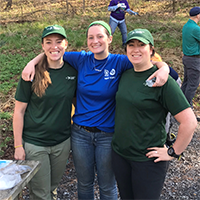 Summer interns with the NYS Parks assisted by using chain saws to cut down the larger branches prior to the clean-up, which certainly made the job easier for volunteers. 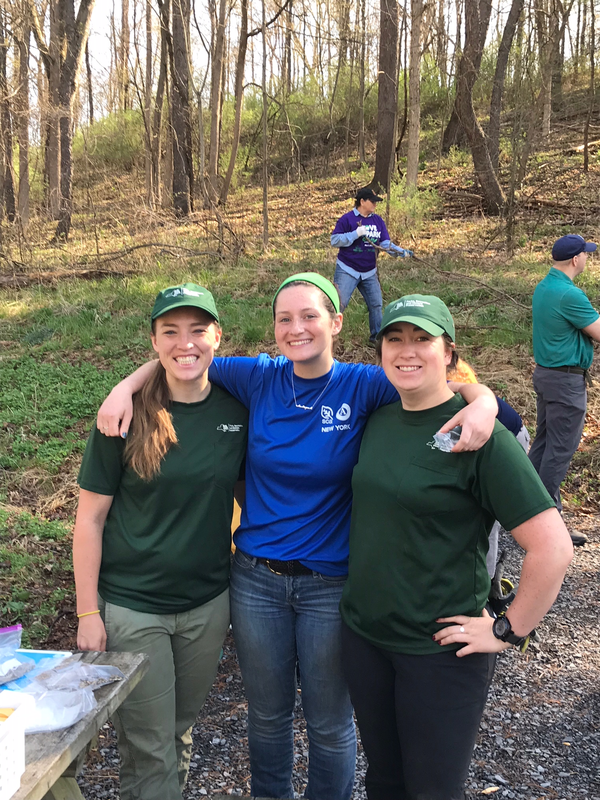 Three summer interns with NYS Parks who had volunteered during the clean-up offered volunteers a nature walk around 11:00am. They led a nice walk along the Catherine Valley Trail, allowing us to truly appreciate the beauty of our parks and trails. We were delighted to take in the sights and sounds of the trail, including a turtle nest! 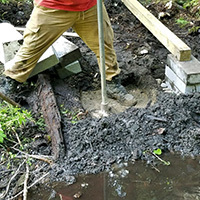 By noon, we'd finished our tasks and volunteers returned all of the tools. We are so thankful for the help they provided and can't wait for next year! 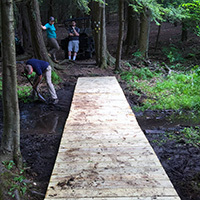 The first Saturday in June is National Trails Day, and in honor of the event, two volunteer Finger Lakes Trail Stewards working for the Finger Lakes Trail Crew and three volunteers from the Chemung Valley Audubon Society met to complete the installation of a boardwalk across a muddy section of the birding trail at Mark Twain State Park. 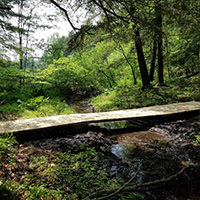 The birding/hiking trail going to the outer loop crosses an intermittent stream that had a log crossing. 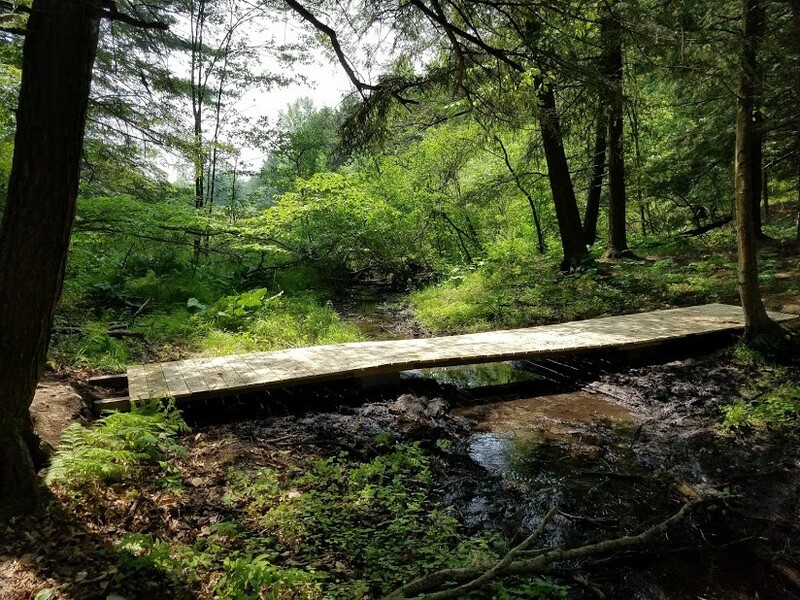 Over time, the logs had been covered by moss, and the crossing had become unstable and dangerous. 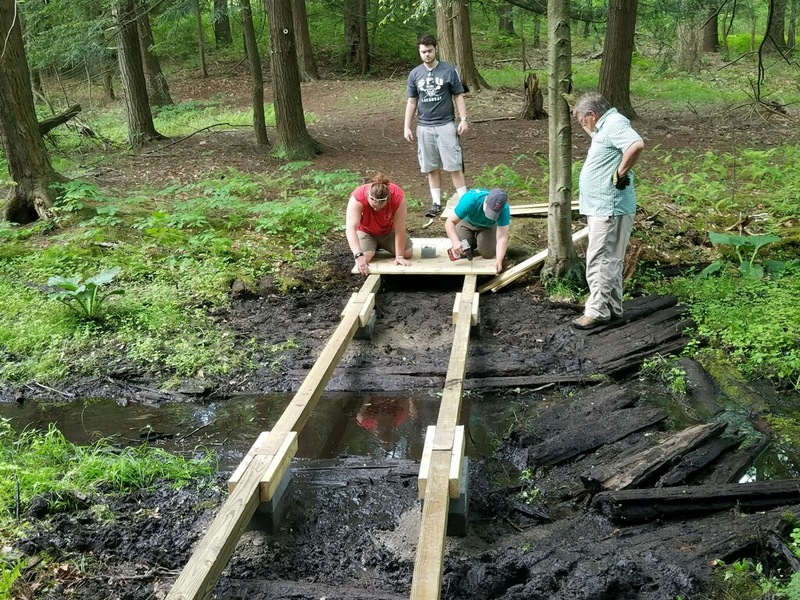 Chemung Valley Audubon Society offered to replace the log crossing with a boardwalk. 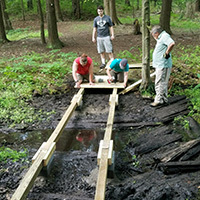 Working with the park manager, we developed plans for a boardwalk that was reviewed by a state park engineer. Once approved, we purchased the lumber and supplies. 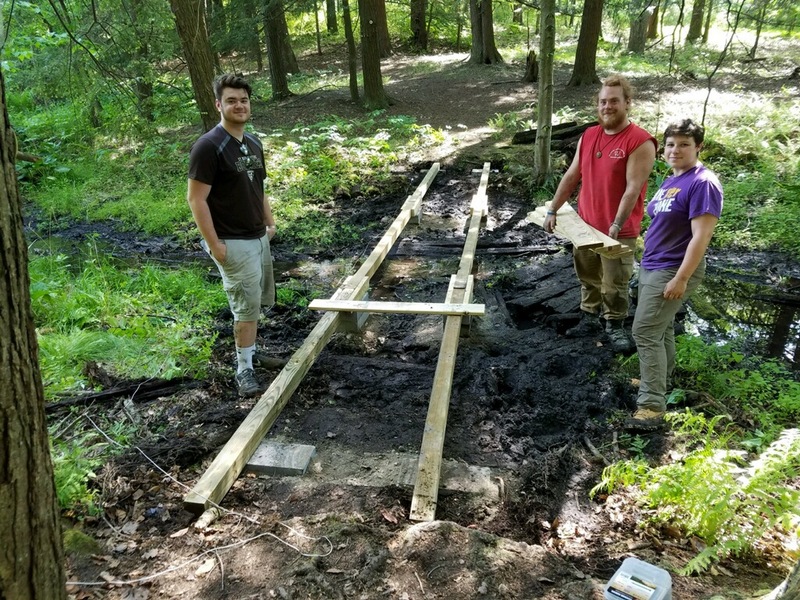 On May 30, 2018, members of Chemung Valley Audubon Society and summer interns from NYS Parks started building the boardwalk by placing the footers and main beams. 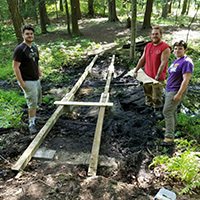 Mark Twain State Park personnel provided great assistance by providing carts to transport the lumber and gravel to the site. 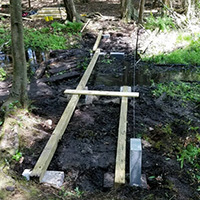 The boardwalk was completed on June 1, 2018, by installing the planks and cleaning up the site. 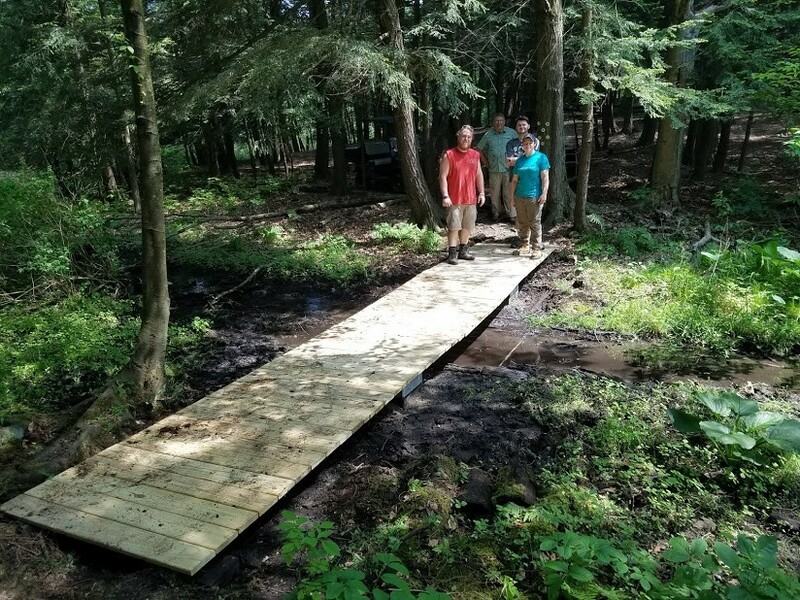 The great assistance and cooperation from the NYS Parks, Mark Twain State Park, summer interns, and members of Chemung Valley Audubon made this an enjoyable project. 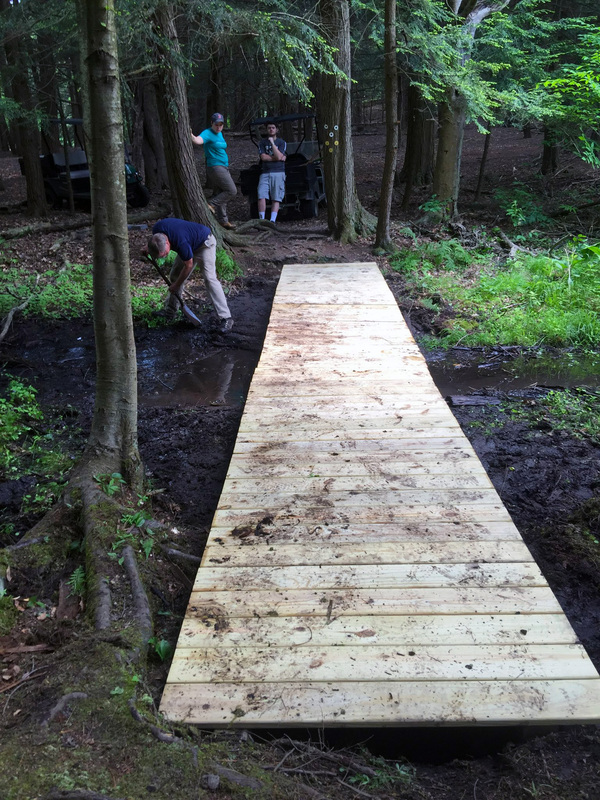 Now hikers have a nice boardwalk to safely cross the intermittent stream to enjoy the outer loop of nature trail. 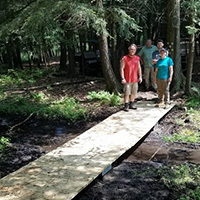 The material for the 26-foot long 4-foot wide boardwalk was funded by a grant to CVAS by the National Audubon Society's Coleman and Susan Burke Center for Native Plants.